“Buddhism in Russia” opened on November 24 in Thimphu, the capital of Bhutan. This is the first ever Russian exhibition to be mounted in the Himalayan kingdom traditionally known as the Land of the Thunder Dragon. The official ceremony at the Indian Embassy’s Jawaharlal Nehru-Wangchuk Cultural Center was attended by Bhutan’s Minister for Home and Cultural Affairs, His Excellency Lyonpo Minjur Dorji; the head of the Russian Ministry of Culture’s Department of Education and Development, O.P. Neretin; the director of Russia’s National Museum of Decorative and Applied Arts, A.N. Sysoenko; the director of the Russian Ethnography Museum, V.M. Grusman; the distinguished Russian expert on Buddhism, Professor N.L. Zhukovskaya; the Indian writer and Ambassador to Bhutan, Pavan Varma; and a senior advisor in the Russian Embassy in New Delhi, S.V. Karmalito. This extensive, meticulously planned and elegantly mounted exhibition is divided into sections: Cosmology and the Pantheon; Life in Buddhist Monasteries; Folk Buddhism; Contemporary Buddhism; and Gifts from Buddhists to the Russian Imperial Family. Here you will see three-dimensional holographic depictions of Buddhist relics presented to the last emperor, Nicholas II; archival photographs from the 19th century; as well as contemporary shots of Buddhist monasteries in Kalmykia, Buryatia, Tuva and other regions of Russia. This exhibition also includes everyday household objects connected with Buddhism, such as toys. The toys have been carved out of birch bark and portray lamas and elements of traditional costumes with Buddhist symbols. All of this Russia has decided to give to the National Museum of Bhutan (in the city of Paro). Bhutan’s Minister for Home and Cultural Affairs, His Excellency Lyonpo Minjur Dorji declared that Russia is well known in the kingdom as a recognized world leader in the fields of science and technology. “This exhibition for us is a genuine revelation,” he confessed. “Although educated Bhutanese are well acquainted with and admiring of the works of Russian writers, painters, actors, sculptors and cinematographers, we are seeing for the first time that, despite the great distances separating our countries, we are very close spiritually and nourished by common cultural and religious sources. We cannot cut ourselves off from the past and we hope that the cooperation in creating this exhibition will be only the beginning of fruitful cultural exchanges in the future.” In conclusion, His Excellency L.M. 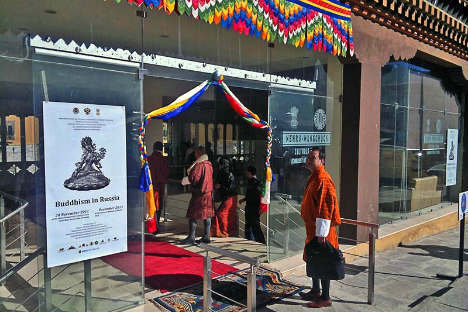 Dorji expressed heartfelt gratitude to the Russian side for its “truly regal gesture” — the decision to make a permanent gift of this exhibition to the National Museum of Bhutan. Friendly contacts between Russia and Bhutan have noticeably increased of late. In October of this year, Russian Ambassador to New Delhi A.M. Kadakin represented the Russian Federation at the lavish wedding ceremony of the current Bhutanese monarch, Jigme Khesar Namgyel Wangchuk, and his Queen, Jetsun Pema.